The army has been a major influence on the emergence of Atelier de l’Armée. The equipment they have, but also the fabrics they use in the army have inspired us for a lot of our creations. 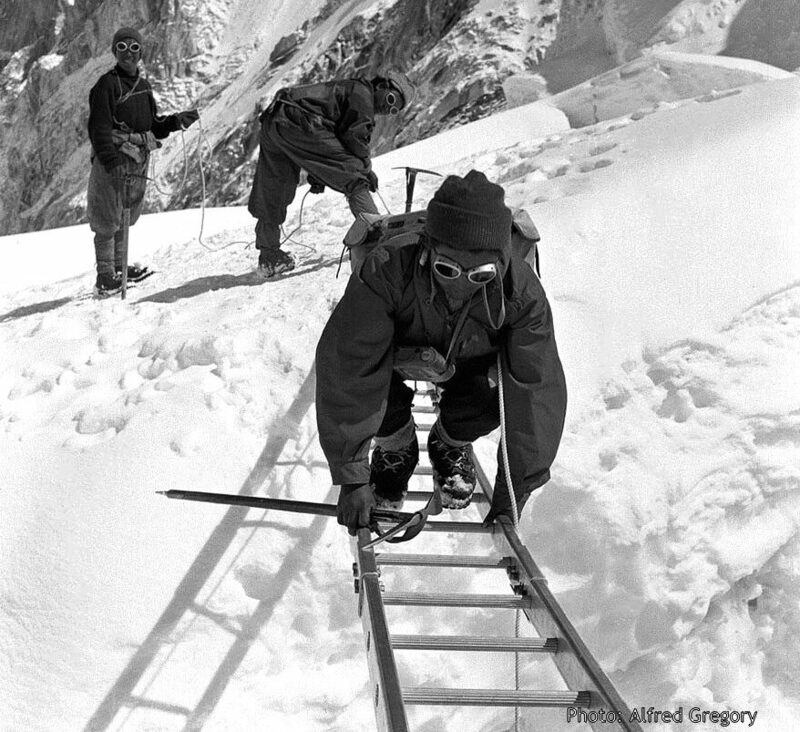 Alike the army, mountaineering hauls a lot of key elements which are important to us. It’s not a coincidence that for this next collection, we sought inspiration in the beautiful art of mountaineering. Here’s why. Mountaineering is the set of activities that involves ascending mountains. Mountaineering-related activities include traditional outdoor climbing, hiking, skiing, and traversing via ferratas. It is a form of art by itself and a team effort to the core. It involves porters, photographers, bridging specialists, expedition leaders and more. The mountain and its beauty is just there, with the summit as the ultimate goal to reach. Every step of the way leads to new decisions to make and hurdles to pass. Glaciers, ravines, steep slopes are to overcome with ropes, ladders, ferratas and above all human’s physical and mental strength. It knows risky encounters on each slope. Constant decision-making which roads to take and to either fall back or move forward. All the while being handed over to the forces of nature such as rainfall, wind, snow, avalanches, extreme cold, high pressure and low oxygen levels. So many elements. Only one goal. The equipment of a mountaineer consists of ropes, boots, crampons and a comfortable climbing pack. A harness, an Ice axe, a shovel and a hypothermia blanket. And these are the things one thinks about first when thinking of mountaineering, but they are merely a fraction of all the equipment necessary to go up the mountain. And all the equipment they bring, logically, the team has to bear up the mountain. One kilo extra to carry isn’t a problem when taking one step, but taking thousands of steps up steep slopes and through deep layers of snow makes the importance come to life considering weight reduction. The equipment should also be extremely user-friendly. Imagine someone suffering hypothermia in a heavy snowstorm. He needs a blanket and he needs it fast. Failing to retrieve it quickly or worse, at all, could simply cause death in those conditions. So the equipment, and the gear to carry around all the equipment should be effective, lightweight and above all very easy to use. Three fundamental aspects which influenced our designing process. 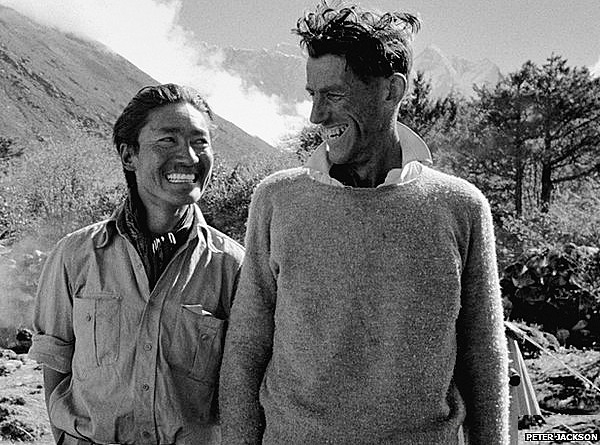 Sir Edmund Hillary and Tenzing Norday after reaching the top of Mount Everest for the first time in history. Edmund Hillary, first to have ever reach the top of the Mount Everest, said: “It is not the mountain we conquer, but ourselves.” Pointing out that the mountain is there and that won’t change by you reaching the summit. You, on the other hand, will conquer obstacles, difficulties, impediments, and eventually yourself. That also counts for the process of creating. Both mountaineering and designing are an expedition of the soul. Yes, you need the right equipment, a good team and courage, but it all boils down to one thing: reaching the top – of your ability. Always followed by a descent. Waiting to start over with the mere aspiration of reaching the top again. And again. To overcome all those obstacles over and over in a new ascent to the peak of the mountain. Or in designing, to the peak of your creativity. And when it all goes well and you reach that top. Chances are you will feel a pure form of happiness, like these guys. That is, essentially, why we create.